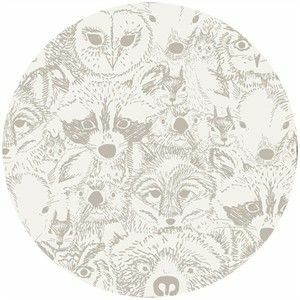 I can’t really believe that I have created an original design for an English Paper Piece quilt top, but I haven’t been able to track down a design like it online… Of course this doesn’t mean that it doesn’t exist or hasn’t been done before – it just means I wish I knew if it was original! Having put together a bunch of 6 pointed diamond stars, I started to think about how I would join them up. I also needed to have a plan of how to take those blocks and make them into a quilt top (by this time, the idea for cushion covers as an outcome was out the window). I’d love to be able to draw out what was in my head, either with paper and pen or electronically, but after spending 10 minutes with the paper and pen and producing a lot of very ungeometric looking squiggles, and then half an hour trying to get my head around a few electronic design tools with zero success, I regressed to my usual default position: make up some pieces and lay them out on the floor to see what the options are. 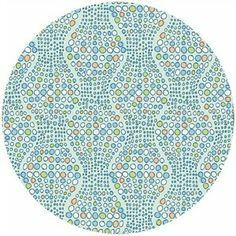 As to the design of the layout, I looked at lots of images of diamond pieced quilts online and read a number of articles written by the people who made them. Before you even get to the joining up part, there are quite simply masses of ways to use diamond shapes, and masses more ways to use the star blocks you can make with them. Some people make their stars (whether 6 or 8 point) in one fabric, or one colour, or one colour and 2 or 3 fabrics, or totally scrappy with whatever is to hand or, like me, using 6 different fabrics with the same colour palette. 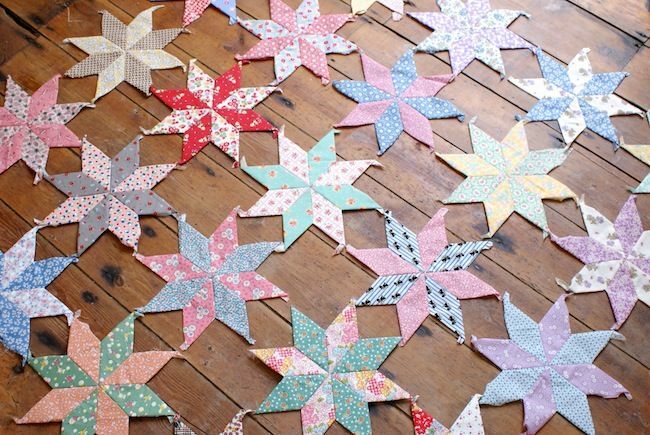 Use diamonds laid in other orientations to join each star block to another – a very popular approach and seen here in this pretty quilt by Rita of Red Pepper Quilts (image from Pinterest). This approach creates large hexagon shapes made up of diamond pieces and really, hexagons are what I immediately see when I look at it. I’m keen to give the diamond shapes centre stage, so not really what I want. None of the three main options I found felt like exactly what I wanted. So, still unresolved on the question of layout, I went off and used my Kaffe Fassett shot cotton to make lots of 2 inch hexagons so that I could lay out the stars and see how they could join up. 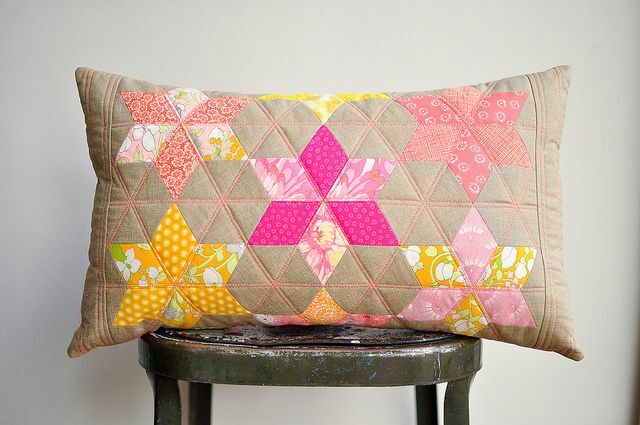 I wasn’t totally in to the idea of using just hexagons for the join up, and I’d already wondered if I could include some triangle shapes into the design to echo the tipi motif in some of the fabrics, so when I started moving things around and saw triangle shaped ‘holes’ appear in one particular configuration, I thought I’d cracked it. 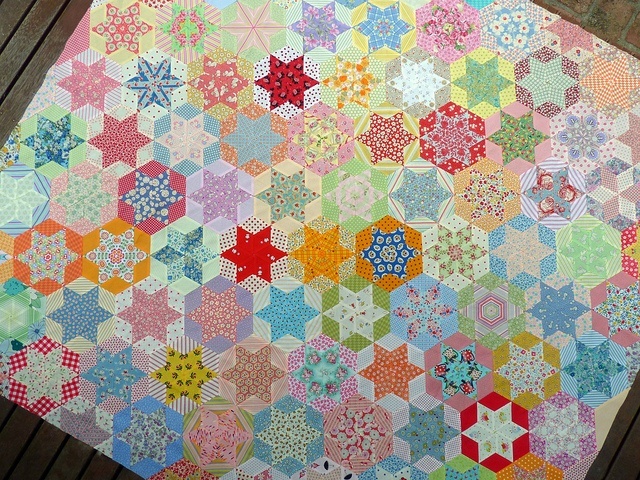 My next step will be to make small blocks of 2 hexies and 2 triangles to fit between the stars and at the top and bottom. I’ll then add diamonds made from the shot cotton to both edges of each of the star blocks, which will start to square up the centre panel. I don’t think I’ve ever seen that layout either, how exciting a potential original design – brilliant.